This is an interesting twist on the usual hatsumode (first shrine visit of New Year’s). 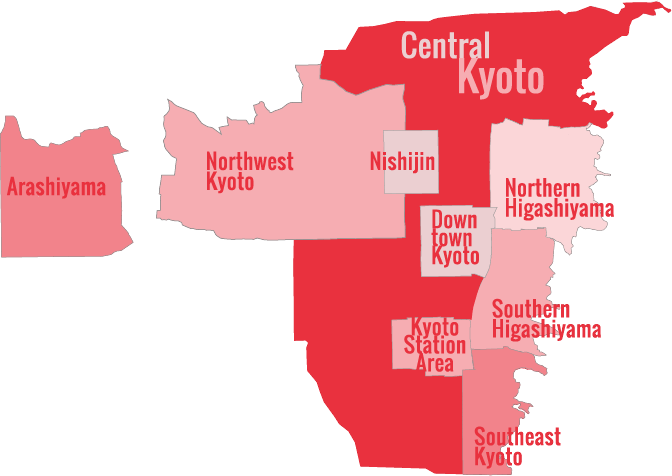 Here, people visit Yasaka-jinja Shrine and purchase sacred ropes, which they then set alight from piles of burning prayer sticks. They then try to transport the rope home without it going out. To do so, they keep the ember burning by swinging the rope around in circles. Needless to say, you can’t take the burning ropes on buses, trains or taxis, so it helps to live within walking distance of the shrine! Once home, the fire is used to light a cooking fire and a sacred candle. Sacred rice cakes are then cooked over the cooking fire. Held at the Kyoto Municipal Museum of Art in the Okazaki Museum District in Northern Higashiyama (a short walk from Higashiyama Station on the Tozai Subway Line), this is one of the best art shows of the year in Kyoto. “Nitten” means “Japan Show” and as the name suggests, this show highlights some of the greatest living artists working in Japan. You’ll see all the main categories of Japanese art on display: lacquerware, shodo (Japanese calligraphy), oil painting, silkscreen painting, sculpture, watercolor, and textile work. You’ll be utterly amazed at the level artistry and creativity on display here! Don’t miss it! The first major exhibit of the year at the Kyoto National Museum is a great way to take in a variety of works, styles and techniques. It’s highly recommended for those interested in traditional Japanese art. This is one of my favorite yearly festivals in Kyoto. 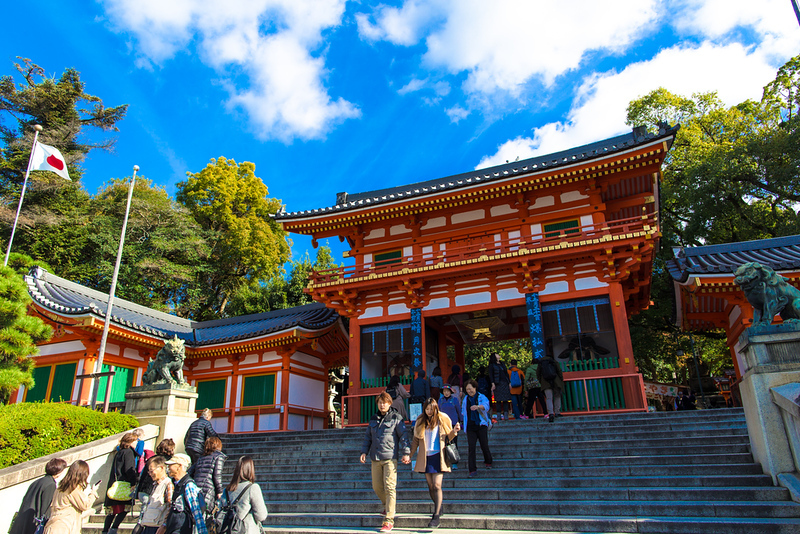 It’s held at Ebisu-jinja Shrine, which is a short walk from either Gion-Shijo or Kiyomizu-Gojo Stations on the Keihan Line (just follow the crowds). It happens all day from the 8th to the 12th, but it’s best to go in the evenings, when the place gets packed and raucous. Ebisu-san (Ebessu-san in Kyoto dialect) is one of the Shichifukujin, the Seven Lucky Gods of Japanese mythology (many originally from Chinese mythology). Ebisu-san is believed to be the god for prosperity and so anyone looking to get rich shows up to ask for Ebisu-san’s blessings in the New Year. People buy all kinds of lucky charms at the shrine, which are hung on young bamboo, which is also sold at the shrine (these are taken home and displayed in a prominent place). 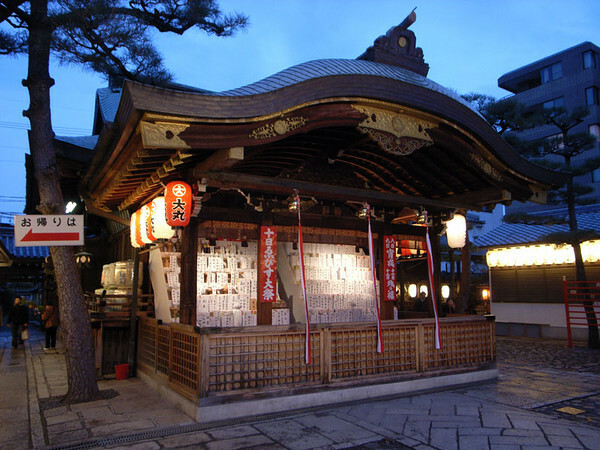 But, the main part of the ritual is waiting to throw some cash into the donation box in front of the main hall, then ringing the bell and saying a prayer to Ebisu-san. After praying to Ebisu, people make their way around to the right side of the main hall and bang their fists on a board there and repeat their prayers. Believe it or not, Ebisu-san is said to be hard of hearing – hence the need to make a racket. Well, maybe it’s not so hard to believe: If Ebisu-san was able to hear everyone’s prayers for wealth, the whole world would be filthy rich! See our comprehensive photo report about attending Toka Ebisu. Like the more famous Toka Ebisu (above), this festival, held at Yasaka-jinja Shrine is a chance for Kyotoites to pray for a prosperous New Year. In the afternoon on the 9th, a parade leaves from the shrine and heads west down Shijo-dori (the best place to watch). First come the shrine maidens and shrine priests, followed by an image of Ebisu and then a “boat” carrying Shichifukujin, the Seven Lucky Gods of Japanese mythology.